We all have our curly haircut nightmare stories. Sometimes, no matter how prepared we are, we just end up with an unflattering haircut that takes us months or years to grow out entirely. 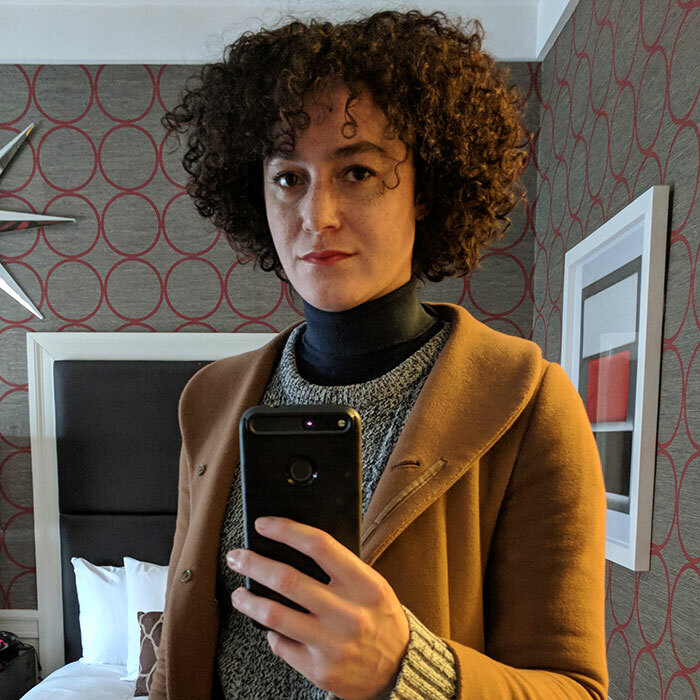 I grew up curly-haired and mixed race in the ‘90s, which made it especially difficult for me to find a hair stylist who understood my texture and who encouraged my curls. Long story short, I quickly gave up on professional haircuts, bought a pair of shaping scissors, and started cutting my hair myself. Here are some of the rules I follow when I’m trimming my own hair. But remember, cutting your own hair is very complicated and risky. We aren’t professional but hair stylists are. Proceed with caution, and if you feel at all nervous, then please don’t try this at home. Many of us have had the dreaded “shelves” effect when we’ve had our hair cut professionally, where different hair textures simply won’t layer as nicely dry as they did wet. To avoid this, I cut my hair when it’s dry, and it's when it’s at that point in the week that I feel my curl pattern is at its most natural. Personally, my curl pattern is different across my head. The curls at the nape of my neck are the least tight, whereas the curls at my crown tend to spring up very very easily. Knowing this about my curl pattern allows me to shape my hair as I trim much more effectively. I can be more liberal with the curls nearer my neck, whereas I’m much more cautious with the curls as I approach the top of my head, knowing that after I’ve washed and dried my hair again next week, they’ll spring up shorter than I might have anticipated. Since I’m cutting my hair on my own, unprofessionally and often with the assistance of a mirror, I only ever trim mere centimeters off my hair at a time, only pruning certain areas instead of giving myself an overall cut. Moreover, I’m as patient as possible, knowing that after I’ve washed and dried my hair at the end of the week, the curls I’ve just trimmed will spring up shorter without the added weight I’ve trimmed off. In other words, the shape of my curls just after I’ve cut them will be different from the shape after I’ve washed later that week. I really think of cutting my own hair as pruning a bonsai tree. I prune very modestly, instead of excessively. And I’m very patient, trimming and waiting to see how that little change affects the whole. The DevaCurl DevaCut technique, which I have of course never been trained in, nonetheless helped me learn how to cut my own hair. The DevaCut technique sculpts curly hair by cutting curl by curl. This technique helps to avoid the dreaded hair-triangle that can easily happen when curly hair is cut straight and blunt. Instead, by cutting curl by curl, I let my individual curls nest together and then examine the shape they’re creating. Cutting your own hair is really tricky, and takes a lot of guts. I wouldn’t recommend it to everyone. But eventually, I started to feel as though I knew the intricacies of my particular hair pattern better than anyone. I felt as though the shape I wanted to achieve was something I couldn’t find a reference picture for and that I needed to accomplish myself. And I felt also that most hair stylists wanted to discourse the density, volume, and frizz that I actually really wanted to encourage in my hair. If this sounds like your mirror image, I hope these three principles I follow will be of use to you. And remember: (trimming) less is more!